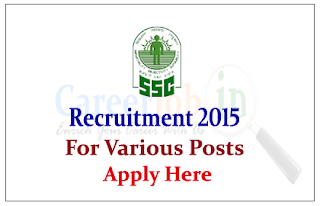 SSC Eastern Region is recruiting for the post of Assistants in various section. Interested and Eligible candidate can apply on or before 20th July 2015. 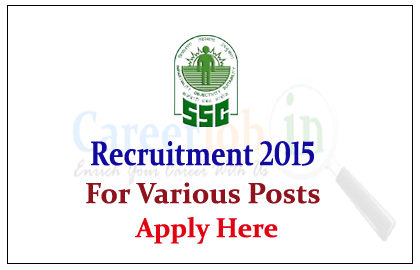 Company Profile: Staff Selection Commission (SSC) was established in 1977 under resolution number 46/1/(S)/74-Estt. (B) dated 4th November, 1975. The mandate of the Commission is to conduct examinations. There are Nine (9) Regional Offices / Sub-Regional Offices of the Commission to assist in the conduct of examinations. The Eastern Regional office of the commission is located in Kolkata and has territorial jurisdiction over West Bengal, Orissa, Jharkhand, Sikkim and the Andaman & Nicobar Islands. How to Apply: Interested and eligible candidate can send their filled application to below mentioned address on or before 20.07.2015. For more details kindly check official notification.